With a Scrumptious Rainbow Holi Thali and Chocolate Bomb Ghujiya! Zambar – The Coastal Kitchen has come up with a special thali to celebrate the festive occasion of Holi. After the wild and crazy holi celebrations, an afternoon meal at this famed south-Indian restaurant is the perfect choice! 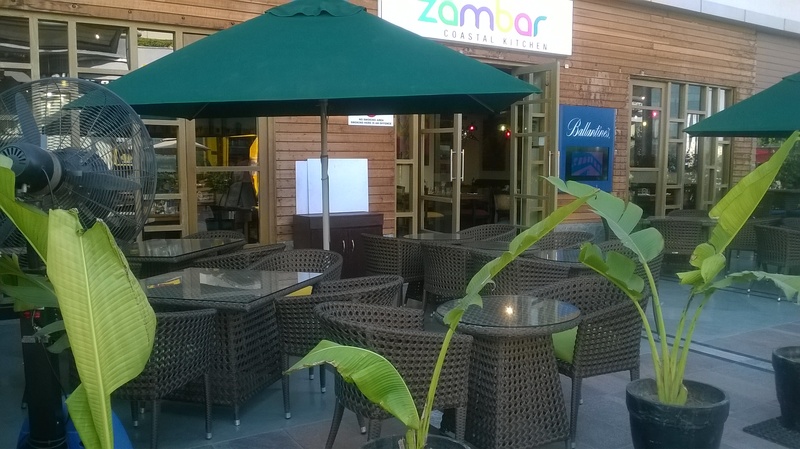 Our trip to Zambar on 5th March was filled with wonderful surprises. The afternoon started with a glassful of hot rasam – a soup that south-Indians are accustomed to eating with rice in between a three-course meal – and a basketful of appalams (Papad). To serve the rasam an appetizer was not a bad idea at all. It had the right amount of tanginess; just enough to whet your appetite. Plus, drinking it out of a glass is always fun! What followed was a treat to the eyes and to the taste buds as well! 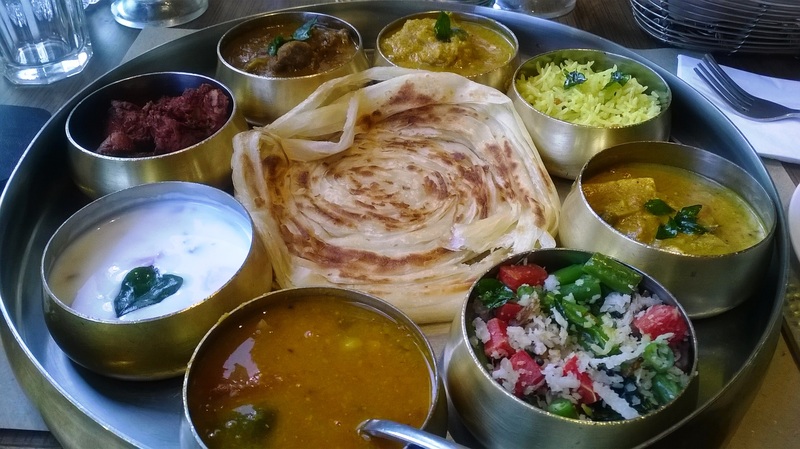 The Rainbow Holi Thali (Non-Veg), with a Malabar parotta bang at the center surrounded by a host of delectable dishes from across the South, was a culinary delight. The sambhar tasted brilliant. It was exactly how one would prepare it at home – balanced flavors, and perfect consistency. The only downside was that there was nothing to eat it with. A bowl of white rice would have been perfect. The parotta was as authentic as the sambhar. It would have been better if it was a little thinner. It was well-roasted otherwise. There were three dishes that you could team with the parotta – Chettinad Mutton Curry, Nilgiri Korma and Paneer Curry. The Chettinad Mutton Curry was the best dish on the thali, followed by the Nilgiri Chicken Korma, which is a famous Hyderabadi cuisine. 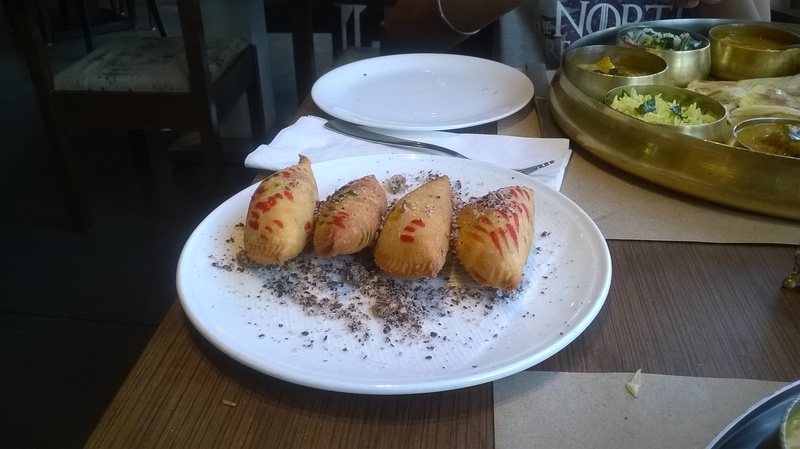 With its delicious curry and succulent paneer cubes, the Paneer Curry was a close competitor to these two Non-veg dishes. The next amazing dish on the plate was the Vegetable Thoran. It is a stir fry dish from Kerala made of finely chopped vegetables, famous for its simplicity. This particular thoran was prepared with beans, carrots and grated coconut. We were bowled over by its minimal yet incredible taste. The lemon rice was a stand-alone dish. It was neither lemony nor was the choice of rice used correct. Using basmati rice for preparing lemon rice is an absolute no. A bowl of white rice in its place would have worked wonders for the thali. The same goes for the Chicken 65 which was dry and unsavory. Both these dishes were the weak points of an otherwise brilliantly-prepared and wholesome thali. 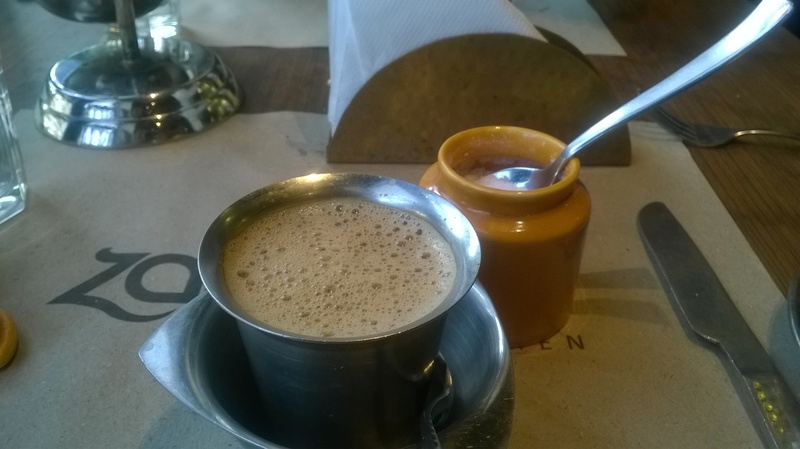 Our afternoon meal ended with a plate of delectable Chocolate Ghujiyas and a cup of filter coffee. After such a heavy meal, we were unsure if we would be able to eat the ghujiyas. But one bite was enough to put an end to our suspicions. They were absolutely light and left you feeling pleasant! We even got a few packed to take home with us. Well, we just finished eating one each in the course of writing this review. Get up and head straight to Zambar! Now!